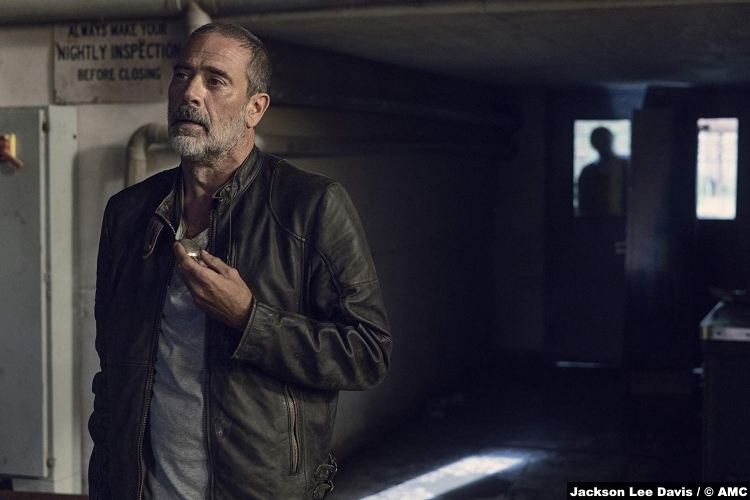 Adaptation may be the lowest stakes mid-season return The Walking Dead has produced in years, and that’s not necessarily a bad thing. 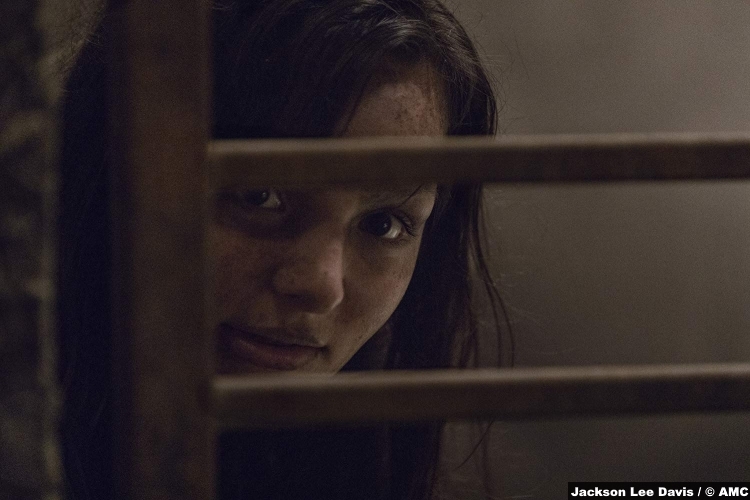 The first half of season nine, a bunch of episodes in which I ran the gauntlet of emotions for this bloody inconsistent mess of a show, ended in a strong fashion by killing the already dead weight of Jesus, while also giving us a proper reveal of the Whisperers, a bunch of human wackos who wear zombie faces to blend in and direct hordes of Walkers. After years of villains with pretty much the same personality: hey, here’s another white, male, character actor who would just as soon kill you as, say, keep fish tanks full of severed heads, or have a very complex relationship with a baseball bat named after his dead ex-wife. 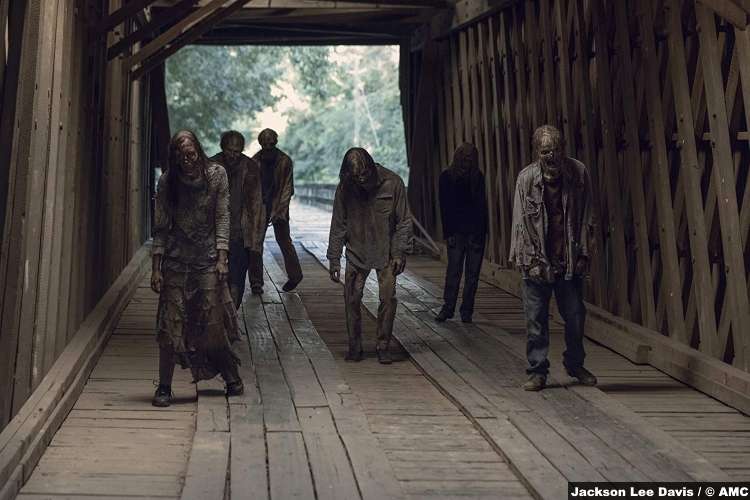 If season nine has a unifying strength, and believe me, I didn’t think it could, it’s that through the seeding and introduction of The Whisperers, the Walkers themselves have rediscovered their fear factor. Much like the mid-season finale, Adaptation has a problem of bloat. Of the many plots that are taking place in this episode, about half of them are actually interesting. So, let’s talk about the good stuff first. Let me state here and now that The Whisperers are awesome. While the last of my good faith went with Rick and that damn bridge, the show needed some fresh blood, and crazy isolated people who relate more to the dead than the living is a brilliant (if a little limited) place to start. 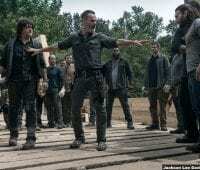 For a start, the constant question of who is a plain old Walker and who is a Whisperer created a lot of tension in the beginning of the episode. 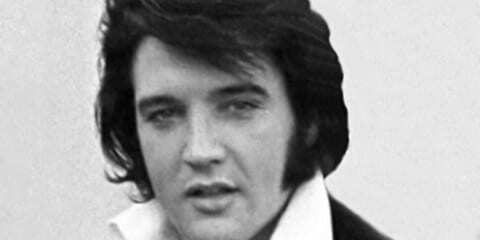 The old rules, that we have seen over and over in the space of nine years, don’t work now. 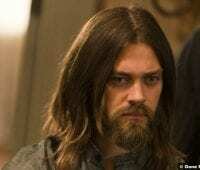 Adaptation went in both directions as Michonne, Daryl, Eugene, Aaron, Magda, and poor dead Jesus (hip hip, hooray!) as it showed the new possibilities presented by these foes with something as simple and creepily as slowly turning a lock. 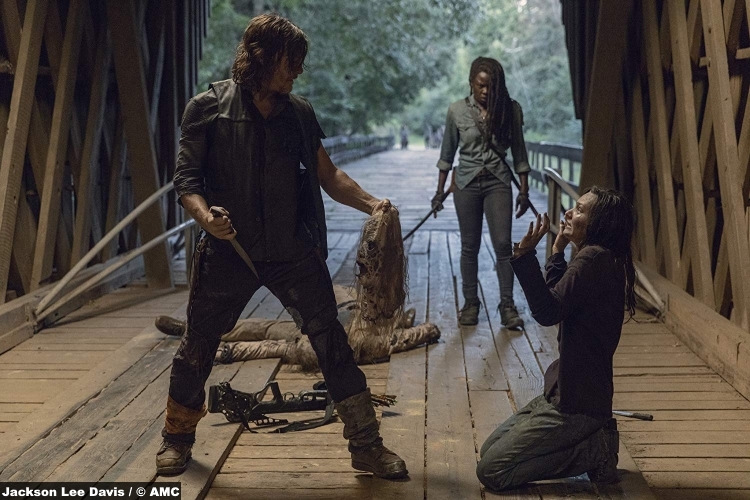 On the other hand, the question of who is a Whisperer shows the titular adaptation of Daryl and Michonne in the moment, especially Darryl’s arrow to the leg as the Walkers then chowed down. This show is still capable of smart action scenes. The tension of this pursuit is undermined somewhat as the group make it back to the Hilltop with ease. Negan had himself an Ozymandias tour of better days gone to pot. 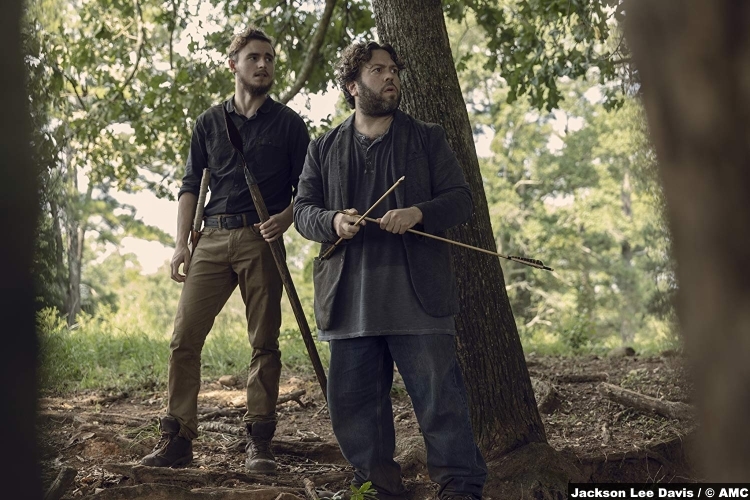 He visited the patch of land where he made his first appearance, the place, in which he killed Glenn and Abraham, where his reign could arguably begin to be brought to an end. He returned to the ruined and abandoned Sanctuary where he proceeded to kill his zombified followers before deciding to return to Alexandria and back to his cell. This is solid stuff, and when Jeffrey Dean Morgan underplays Negan he approaches a place that could be mistaken for interesting. 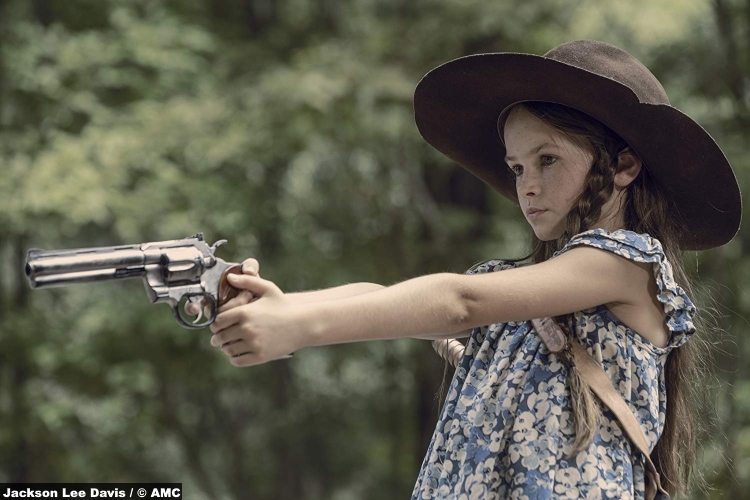 It’s just a shame that the two scenes with Judith that bookmark this journey are awful. It’s not the actor’s fault, it’s the fact that this relationship is not defined enough to have the desired impact. 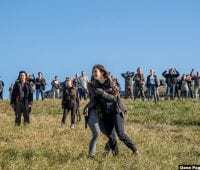 The show is still recovering from the decision to have two time jumps in the space of five episodes. The rest of the episode was frankly a little dull. 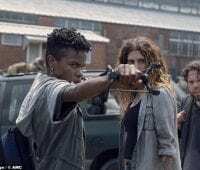 Daryl had an ok moment threatening the Whisperer girl, who is named Lydia, but Adaptation is proof that the show is not only recovering from another time jump, it’s recovering from a quite substantial change to the status quo. Case in point is Luke and Alden, both of whom are in the early days of being regular characters. The problem, and this is just my problem, is that I don’t care enough about them for their possible death at the hands of the Whisperers to make much of an impact. I actually want them to die in an entertaining fashion. 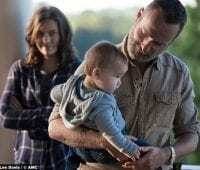 The same goes for Henry as The Walking Dead is coming perilously close to suggesting that Daryl and Henry will fill the hole left by Rick and Carl. When we all know that Dog is the new Carl. 6/10 – Entertaining enough, but the show still has a lot of work to do to get back on track.